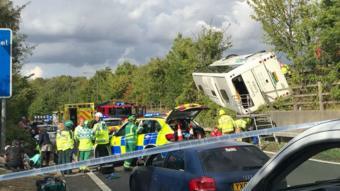 Dozens of passengers have been taken to hospital - three with serious injuries - after the coach they were travelling in overturned on the M25. The Princess Royal University Hospital in Orpington has declared a major incident alert. The crash was on the anti-clockwise carriageway near junction three.